Everyone knows that uninstalling any sort of software can have terrible consequences for the operating system. From poorly-deleted registries to useless files and libraries spread around the entire hard drive. Norton, the security company, is aware of this fact and that's why it has launched Norton Removal Tool, the utility in charge of completely uninstalling any of its products, using brute force if necessary. 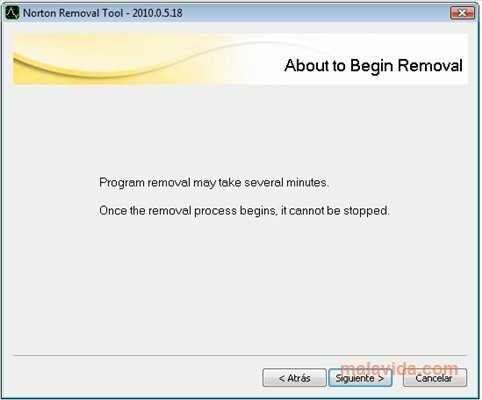 With Norton Removal Tool we can remove from our PC the following programs: Norton AntiSpam, Norton Antivirus, Norton Ghost, Norton GoBack, Norton Internet Security, Norton Password Manager, Norton Personal Firewall, SystemWorks, Norton Confidential Online, Norton Add-on-Pack, Norton Save and Restore, Norton Safe Minder, Norton SafeWeb and the renowned Norton 360. 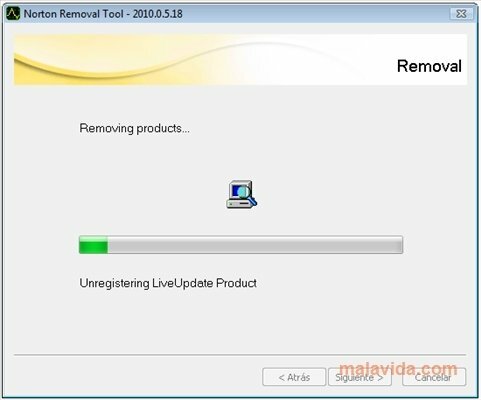 All in all, Norton Removal Tool can remove all the security, backup and protection tools commercialized by Symantec for Windows. Only valid for those products installed on Windows XP or later.